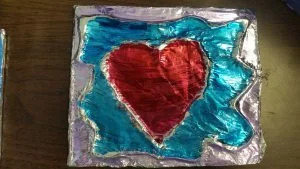 This 3D craft project using aluminum foil and cardboard will keep kids busy. Because this craft requires household items, it’s also a good craft to teach kids about recycling. Not only is this craft fun to make but it also comes out beautiful. We did this project in our summer camp program with kids ages 8-12. They all really loved the project. I don’t recommend doing this with children younger than 8 as it may be a little tricky for them. 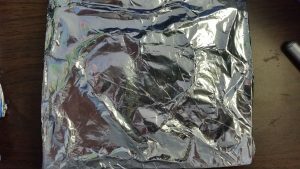 Follow the step-by-step directions below to make your very own aluminum foil and cardboard project. 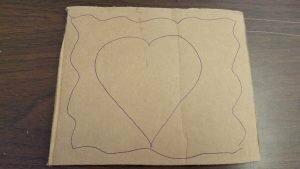 Step 1: Using a pencil have the children draw a design on the cardboard. Encourage them to make a big design such as a large heart, flower, abstract design. 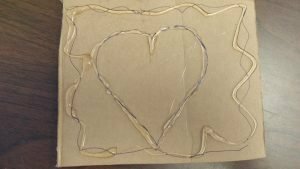 Step 2: Have the adult outline their design with the hot glue gun. Make sure you make the outline thick. Step 3: Once the hot glue dries, cover the front of the cardboard in aluminum foil, over lap the sides. Turn the cardboard over and tape the foil around the sides, so it stays on. Step 4: Turn the cardboard over so the side with the design is facing front. Press down on the foil and the design will start to show through. Step 5: Have the children color in their design using the sharpies of permanent markers. All finished! We displayed all of the kids projects at the end of the summer art show and it was a success.